I wouldn’t normally write a review of a sample sachet, especially when it’s skincare as they don’t include anywhere near enough product to test it out properly. 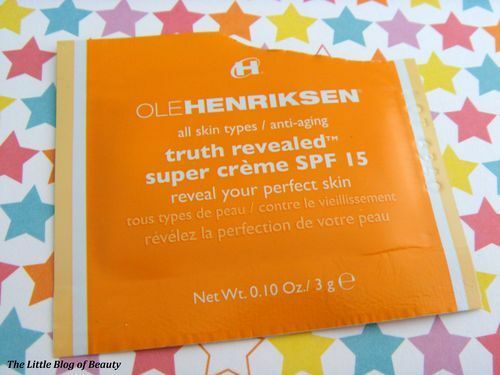 However, going on first impressions I’ve decided to blog about Ole Henriksen’s Truth Revealed Super Creme. I have so many sample sachets floating around but I noticed this lurking in a box of products (the orange sachet is rather eye catching) so I thought I would give this a try next. I’ve been using this morning and night for a few days now and it’s still going with possibly a few more days left in it. This is quite a rich reasonably thick cream that smells absolutely amazing, like sherbet or refreshers! You only need to use a small amount and it applies so nicely. 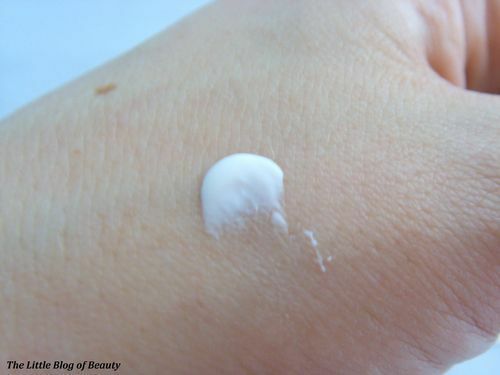 It absorbs straight away and leaves my skin feeling so smooth and moisturised and slightly plumped. Luckily I don’t have any wrinkles yet and I don’t think I really have any fine lines either but my skin has been looking really good since I started using this cream. I think this has already helped improve the appearance of my acne scaring, redness and some pigmentation I have. So I took to the Internet to look for the full size product….and I discovered I’d need to remortgage to be able to afford it! Ok so I don’t actually have a mortgage and it’s not that expensive (well it is, but not as expensive as some products) but basically this is something I certainly can’t afford at the moment. Prices seems to vary across the Internet but I have seen them range from £41 up to £63. If you can afford this sort of price tag then I would definitely recommend giving this a try.